From Askart: Francis De Erdelyi was recognized for his artistic influence on many emerging California artists during the 1940’s, and was known for colorfully capturing the plight of the working class in their own environment. DeErdely was born in Budapest, Hungary in 1904, where his father was a Hungarian military officer. 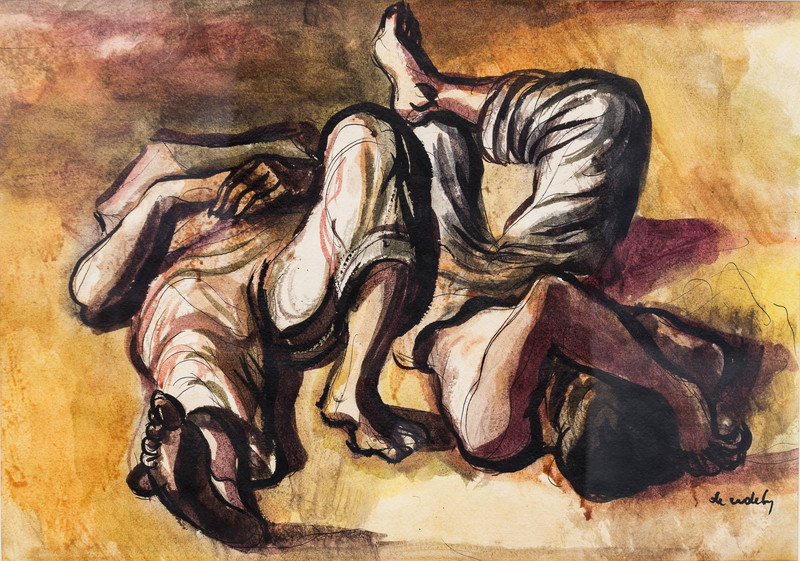 His experiences as a teenager during World War I fueled the often horrific imagery in his earliest art work. His graphic depictions angered the Gestapo, and he was eventually forced to flee Hungary. In his youth he attended the Royal Academy of Art in Budapest and during the 1930’s he studied throughout Europe, at the Academy of San Fernando in Madrid, Spain and at the Sorbonne and the School of the Louvre, both in Paris, France. He lived in Belgium, Holland, France, Czechoslovakia and Austria before coming to Los Angeles, California in 1944. His rich academic background is reflected in his use of mixed media. De Erdely often made drawings in ink, crayon, charcoal or pencil, then applied a watercolor wash over it. He liked to sketch and paint in Mexico, taking an interest in its people and culture. He painted his subjects as they existed in everyday surroundings, often depicting figures at work or in nature. While living in Los Angeles during the 1940’s, he exhibited with the California Watercolor Society and the American Watercolor Society. DeErdely joined the faculty of the University of Southern California in 1945 and served as the Dean at the Pasadena Museum School from 1944-1946. He died in Los Angeles, California in 1959.